DIME WESTERN MAGAZINE – The Leading Western Magazine, Jan, 1948. 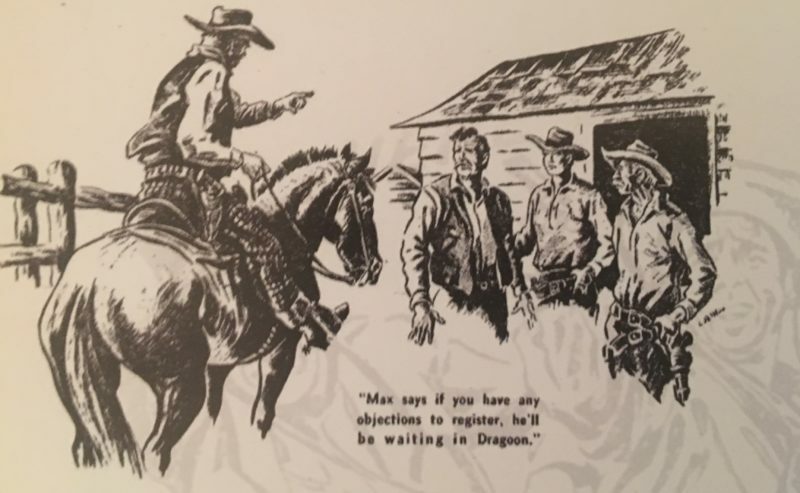 Folks branded young Joey Munro a plain damned fool for shipping twelve thousand dollars of somebody else’s dinero across Texas in a cattle caboose. But Joey reckoned the money was as good as in the bank – hell, didn’t he have a jailbird sitting sixgun guard on the gold? He handed the draft through the window and said, “I’m Joey Munro. I’ll take it in hard money, or as much as I can get. The rest in bills, please.” The teller goggled at the size of it, stared at the kid and said, “Th-there ain’t that much hard money in the world! Twelve thousand, seven hundred and twenty dollars! Why don’t you just take the draft home and put it in the bank there?” – page 36. There was enough cow-county in the Big Sag to hold the Bradded H, Barbed B outfits and six nester spreads, but nevertheless a range war was clouding the Montana sky – and it could turn into a bad’un. – page 7. 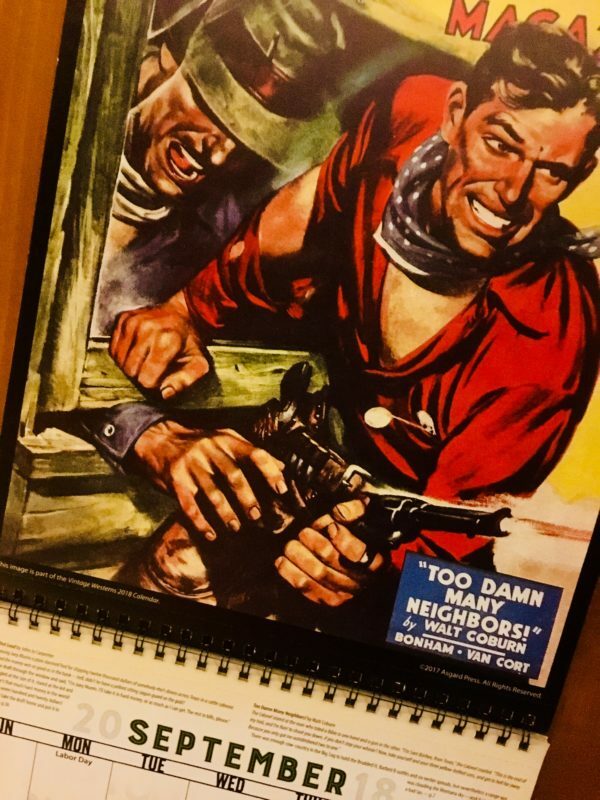 You may find the 2018 Vintage Westerns Calendar for 50% OFF the normal price right HERE. All 9” x 12′ Monthly images suitable for framing! Just perforate and accentuate! ← Justice Society of America Starring SUPERMAN and BATMAN! My name is Zachary Rhein, a distant cousin of Walt Coburn and am currently a film student and was wanting to do a possible documentary of Walt and was wondering if there was anything could send my way to help. Much thanks in advance. Hi Zachary – Sounds interesting! Please email andy@asgardpress.com to get a dialog started. Thanks!